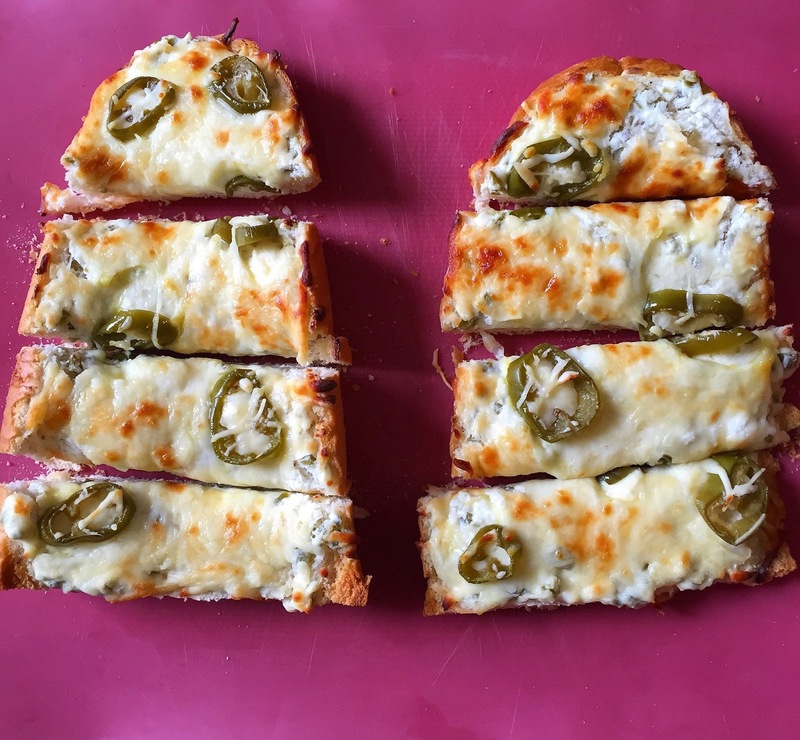 It’s All About the Spice…Jalapeño Popper Bread!!! 1. Start by pre heating your oven to 400 degrees F, and placing parchment paper on a sheet pan. 2. Cut the bread length wise, creating two long loafs. Place them cut side up. 3. To the bread loafs, brush melted butter on them. Also, evenly sprinkle the tops with garlic powder. 4. Put the loafs back together, as if you are making a sandwich, and wrap in foil. Place the bread into the oven for 5 minutes. 5. While your bread is heating in the oven chop the pickled jalapeño slices. Make sure to save 10-12 whole jalapeño slices, because we are going to top the bread with them. This allows people to see what is in the bread vs biting into a potential spicy SURPRISE! 6. After you have chopped your pickled jalapeños add them to a medium size mixing bowl. Also to that bowl add cream cheese, sour cream, salt, and pepper. Mix everything thoroughly and set aside. 7. Our 5 minutes in the oven should be up, so remove and uncover your bread loafs. Place the bread loafs cut side up on your parchment lined sheet pan. 8. To the hot loafs, carefully and equally spread the the jalapeño cream cheese mixture. 9. Then top the cream cheese mixture with shredded mozzarella. Top the mozzarella with the reserved whole jalapeño slices. Place the bread back into the oven for 2-4 minutes or until the mozzarella cheese has melted. ***TIP: I also like to turn my broiler on at the very end to brown the cheese a little bit before removing from the oven. This is a total preference thing; but if you do decided to use your broiler be careful not to burn the bread. 10. Remove from the oven when melting is complete and let rest for 1-2 minutes before cutting. Between the cream cheese mixture and the hot melted cheese I don’t want you to get burned. ***TIP: To serve the jalapeño bread…I make 2 inches horizontal cuts and turn the jalapeño bread into jalapeño sticks. 12. See attached kitchen items used while making this dish!!! « Grapefruit Avocado Salmon Salad…New Year, New You!! !